You are here: Home > Blog > Flora & Fauna > Holly, predicting the weather ? Back in November, a number of papers reported that our holly trees were full with their bright red berries, and that according to folklore this was a sign that a hard winter was to come. There is no clear logic to this, as it is the Spring weather that determines whether there are insects around for the flowers to be pollinated, plus sun and warmth in early autumn to help the berries to ripen. The berries are particularly plump and abundant this year. The last ‘good berry’ year was last year (2009) and the winter that followed was the coldest for some 30 years. Already, we are experiencing cold and severe weather conditions so perhaps the berries are ‘right' again. 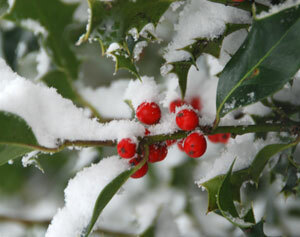 Holly has been used to decorate homes for centuries, and is particularly associated with mid-winter festivals. Its evergreen leaves with their prickles around the entrance to the house were thought to stop 'evil forces' entering. The leaves also have a high calorific value and in the past were used as fodder crop for cattle or sheep, and woods or groves of holly trees (known as hollins) were not uncommon. The wood of the holly was once used for the making of bobbins for the cotton industry. In 1802, some one hundred and fifty thousand holly trees were felled (Needwood Forest, Staffs *) to supply the northern cotton mills with bobbins. Whilst the berries are bright and attractive, they are also toxic. [The berries are violently emetic and purgative]. Holly, Ivy and Mistletoe are all associated with the festive season. They are all evergreen plants, whose foliage tends to last quite well in garlands, wreaths and other displays. 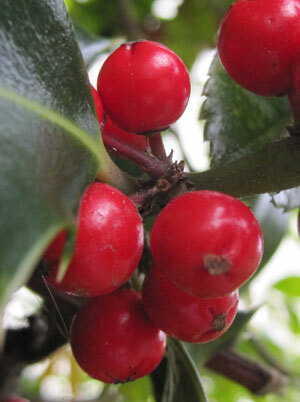 Yes, ominously a large holly tree near us (in SE London) is covered with bright red berries ! I’ve always found holly produces huge quantities of berries before an extremely cold winter. Last year our bush was almost bright red with berries and it turned out to be one of the harshest winters for many years. I love the first photo of the snow on the holly bush – a real festive scene!